Selena Gomez finally hits the Singapore stage this 27 July for one night only! Selena has made her mark in entertainment by conquering film, music and television at an early age. As a recording artist, she has sold over 45 million tracks worldwide and most recently released her critically acclaimed album Revival. The album debuted at number 1 in the US and featured top singles “Same Old Love”, “Hands to Myself” and “Good for You” which featured a guest appearance by rapper A$AP Rocky. Gomez was released from her recording contract with Hollywood Records following the completion of her compilation album For You in 2014. From it was released “The Heart Wants What It Wants”, her second top-ten single on the Hot 100. She subsequently guested on Zedd’s hit EDM single “I Want You to Know” and signed with Interscope Records to continue work on her sophomore studio album, Revival. 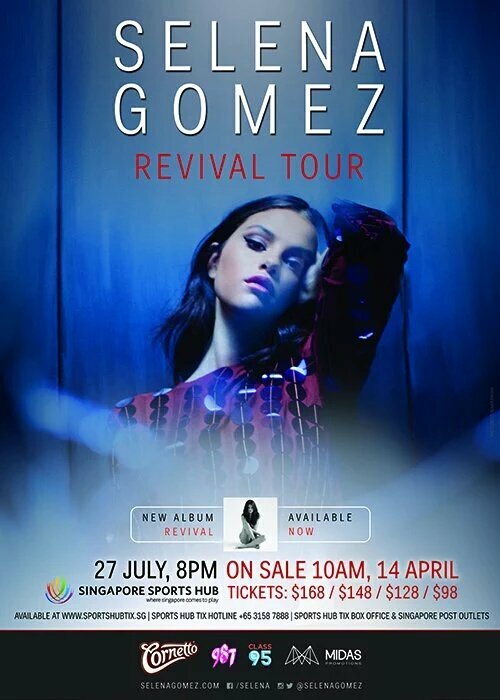 Catch Selena Gomez ‘Revival Tour’ at the Singapore Indoor Stadium for one night only this 27 July.